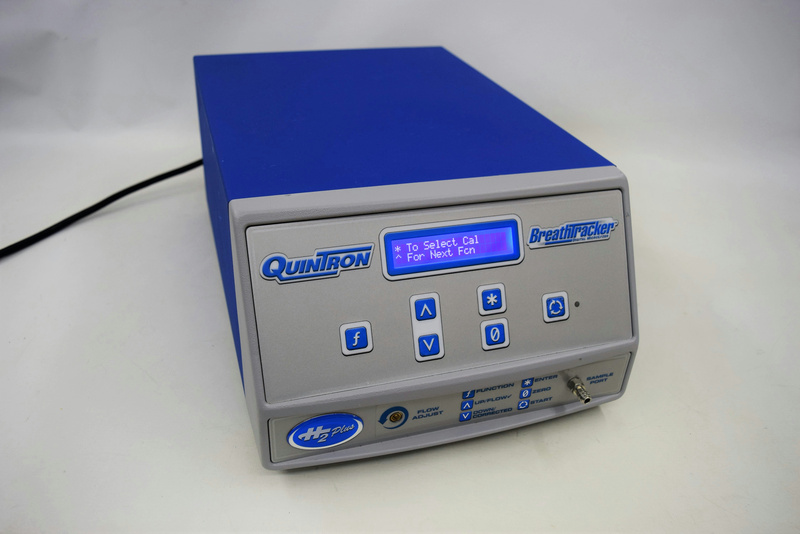 Quintron BreathTracker H2+ plus Digital Microlyzer Clinical HBT Bacterial . New Life Scientific, Inc. The digital microlyzer is in excellent cosmetic condition and underwent a series of tests to validate functionality. Please see the technician's evaluation below for more details. New Life Scientific technicians performed a series of trials by exhaling into the test port. There were hydrogen readings recorded every time, but the instrument recognized carbon dioxide present once. The technicians think the CO2 datum reflects the lack of calibration material, sampler kits, and accessories. The technicians suggest that the buyer get it properly calibrated prior to application. Take the guesswork out of gas work with the gold-standard in the measurement of Hydrogen (H2), Methane (CH4) and Carbon Dioxide (CO2). The BreathTracker analyzer is used by medical professionals to accurately measure Hydrogen, Methane and Carbon Dioxide in exhaled breath. These analytical values presented by the analyzer are not intended to be the sole determinant of diagnosis and are used in conjunction with other clinical factors known by the physician, to allow the physician to diagnose Small Intestinal Bacterial Overgrowth (SIBO) and Carbohydrate and Sugar Malabsorptions (e.g Lactose Malabsorption/Intolerance and Fructose Malabsorption). Samples are collected in various time intervals and numerical values in parts per million (ppm) are provided by the analyzer. These values are then reviewed by the medical professional in conjunction with patient history and medical conditions to assist physicians in their assessment of how their patient's gastrointestinal system responds to the sugar and whether dietary changes and/or antibiotic treatment of a condition is desired.